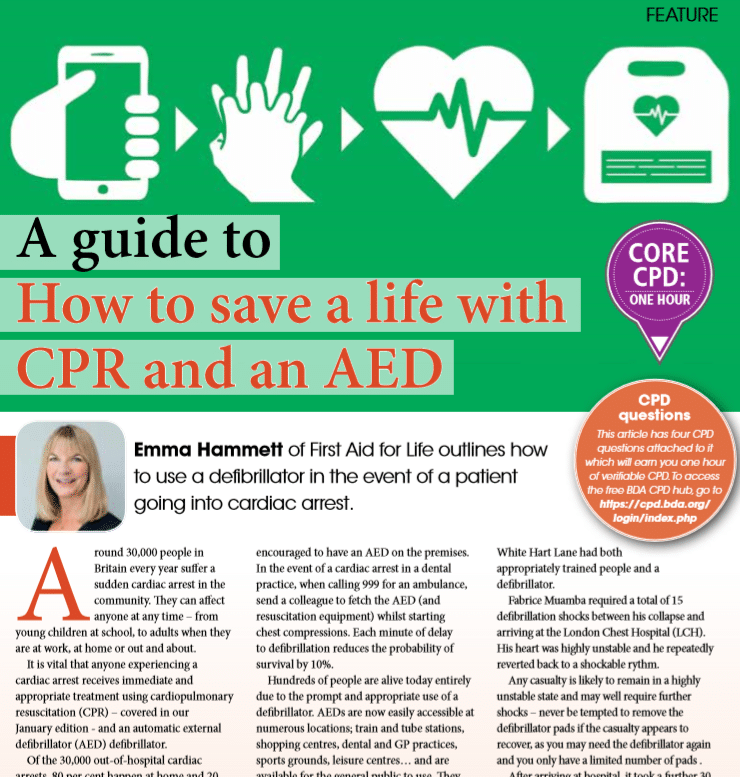 Emma Hammett of First Aid for Life outlines how to use a defibrillator in the event of a patient going into cardiac arrest. Around 30,000 people in Britain every year suffer a sudden cardiac arrest in the community. They can affect anyone at any time – from young children at school, to adults when they are at work, at home or out and about. It is vital that anyone experiencing a cardiac arrest receives immediate and appropriate treatment using cardiopulmonary resuscitation (CPR) – covered in our January edition – and an automatic external defibrillator (AED) defibrillator. Of the 30,000 out-of-hospital cardiac arrests, 80 per cent happen at home and 20 per cent occur in public places – this includes dental practices. Being prepared for such an eventuality is covered in the General Dental Council’s Scope of Practice (2013). Research1,2 has been shown that administering defibrillation within 3–5 minutes of collapse can produce survival rates as high as 50–70%. Dental practices are therefore encouraged to have an AED on the premises. In the event of a cardiac arrest in a dental practice, when calling 999 for an ambulance, send a colleague to fetch the AED (and resuscitation equipment) whilst starting chest compressions. Each minute of delay to defibrillation reduces the probability of survival by 10%. Hundreds of people are alive today entirely due to the prompt and appropriate use of a defibrillator. AEDs are now easily accessible at numerous locations; train and tube stations, shopping centres, dental and GP practices, sports grounds, leisure centres… and are available for the general public to use. They can be semi-automatic (you still need to press the shock button when indicated) or fully automatic (the machine shocks automatically when a shock is advised). Defibrillators are absolutely vital to be able to bring someone back following a cardiac arrest. CPR keeps the heart and brain full of oxygenated blood and acts as a life support machine; however, it is the AED that enables the heart to be shocked back into sinus rhythm. These two interventions together give the casualty the very best chance of survival. One of the most high-profile cases surrounding defibrillators involved footballer Fabrice Muamba, who suffered a cardiac arrest in 2012. He was incredibly lucky that his Tottenham Hotspur FC, at White Hart Lane had both appropriately trained people and a defibrillator. Fabrice Muamba required a total of 15 defibrillation shocks between his collapse and arriving at the London Chest Hospital (LCH). His heart was highly unstable and he repeatedly reverted back to a shockable rythm. Any casualty is likely to remain in a highly unstable state and may well require further shocks – never be tempted to remove the defibrillator pads if the casualty appears to recover, as you may need the defibrillator again and you only have a limited number of pads. After arriving at hospital, it took a further 30 minutes of delivering shocks and medication to stabilise Fabrice. Despite undergoing CPR for an astonishing 80 minutes, Fabrice Muamba went on to make a full recovery and is now an ardent campaigner for the importance of the AED. The sooner you recognise there is a problem, get help on the way, start CPR, use a defibrillator and then transfer the casualty to advanced medical care – the better the outcome. The defibrillator administers a shock to stop the heart. Enabling the heart’s own system to reboot and hopefully restart in sinus rhythm. It should only be used when someone is unconscious and not breathing. The machine analyses the casualty’s heart rhythm and will only allow a shock to be given if they are in a shockable rhythm. It is not possible to override this with an AED and if a shock is not advised you should continue to give CPR until the ambulance arrives. Ensure the team are all competent and confident in performing the best possible CPR – pushing down 5-6 cms on the centre of the chest at a rate of about 2 compressions per second and ensuring a release from pressure in between compressions – to enable the heart to refill. An AED will only allow you to administer a shock when someone is in ventricular fibrillation (VF) or ventricular tachycardia (VT). VF – ventricular fibrillation (Figure 1) causes the casualty to become unconscious and stop breathing. VF is a shockable rhythm and if a defibrillator is used promptly on someone in VF there is a strong chance that stopping the heart with the shock will allow the heart to restart in a normal rhythm. The longer someone remains in VF the less likely it is that their heart will restart normally. If an area of heart muscle is damaged due to a heart attack, the casualty may well survive, depending where the damage occurs and how much heart muscle is lost. Because the heart has so many back-up systems, even if one of the pacemakers is damaged, the heart itself may still be able to generate sufficient electrical impulses to contract. The heart is an amazing organ comprising cells capable of independently generating impulses; the 2 pacemakers work together and act like the conductor of an orchestra initiating the correct impulses and ensuring that the heart beats to a fairly regular rhythm. When an area of heart muscle is damaged it becomes unstable and often fires off its own impulses independently and this interferes with the co-ordinated rhythm generated by the pacemakers. This misfiring affects the rhythm of the heart and causes it to become irregular. If the heart experiences a ‘misfiring’ beat at the point when the cells are re-charging, this can upset the whole system and the different cells fire independently of each other causing the heart to quiver erratically and chaotically. This is known as ventricular fibrillation and whilst the heart is shaking instead of pumping, it is incapable of effectively circulating the blood around the body. VT – Ventricular tachycardia (Figure 2) is another shockable rhythm. The heart rate has become so fast that the chambers are incapable of refilling and so there is little or no blood being pumped around the body. If the casualty is unconscious and not breathing, you can use a defibrillator, which will stop the heart and hopefully restart it in a normal rhythm. Asystole – Flat-lining (Figure 3, 4) – This is too late for an automated external defibrillator (AED) in the community, as the heart has run out of oxygen and is now still. If you have help – the bystander will need to let the emergency services know that the casualty is unconscious and not breathing and bring the AED as quickly as possible. Continue CPR whilst waiting for the defibrillator. As soon as the AED arrives it should be activated (usually done just by opening the lid, or pressing an obvious button)(Figure 5). It will then start speaking to you. If there are two of you, one should continue with the CPR, whilst the other, attaches the leads to the AED (if necessary) dries the chest (and shaves them if necessary) and places the pads on the chest as per the diagrams (Figure 6). Peel the pad off the backing one at a time and place onto the dry chest according to the diagram. Place the other on the casualty’s left hand side, over their lower ribs. If you realise you have put the pads on the wrong way round – do not remove them as the AED will still work fine. If the AED offers a trace, this may appear upside down – but this will not affect the functioning of the AED. The AED will analyse the heart rhythm. Stop CPR when instructed and ensure no one is touching the casualty (Figure 7). The paramedics will need to know what happened, how long you have been doing CPR, whether a shock was advised by the AED and if so, how many shocks have been given (Figure 9). Flammable atmosphere – turn off oxygen when giving the shock, do not use in the presence of petrol fumes. Some defibrillators have a switch or key that adapts it for child use. If you have a child over the age of 1 who needs a defibrillator, but only have adult pads available – adult pads can be used with one on the front of the child’s chest and the other placed directly opposite, on the centre of their back. If it is a baby that needs resuscitating, you must use paediatric pads or the paediatric capability (Figure 11). All clinical dental areas should have immediate access (within the first minutes of a cardiorespiratory arrest) to oxygen, resuscitation equipment for airway management including suction, and an automated external defibrillator (AED). The standard AED sign (Figure 12) should be used in order to reduce delay in using a defibrillator in an emergency (www.resus.org.uk/defibrillators/standard-sign-for-aeds/). Follow the manufacturer’s recommendations for the maintenance of the AED. It should be kept in a prominent place and everyone in the building should have easy access to it and know where it is kept. Check the expiry date for the battery and pads and order replacements in good time. Spare pads and a battery are highly recommended. Most AEDs have warning lights and alarms to alert you if there is a malfunction or if the battery is running low. Some have a gauge that indicates battery charge. Ideally the AED should be briefly checked daily to ensure it is in good working order in case you need it. Most units have a battery life of around 5 years. Finally, the British Heart Foundation and Association of Ambulance Medical Directors in partnership with the University of Warwick have a national out-of-hospital database of community cardiac arrests and would welcome your input: https://warwick.ac.uk/fac/sci/med/research/ctu/trials/ohcao/. Emma Hammett is a qualified nurse and award-winning first aid trainer with over 30 years’ healthcare and teaching experience. 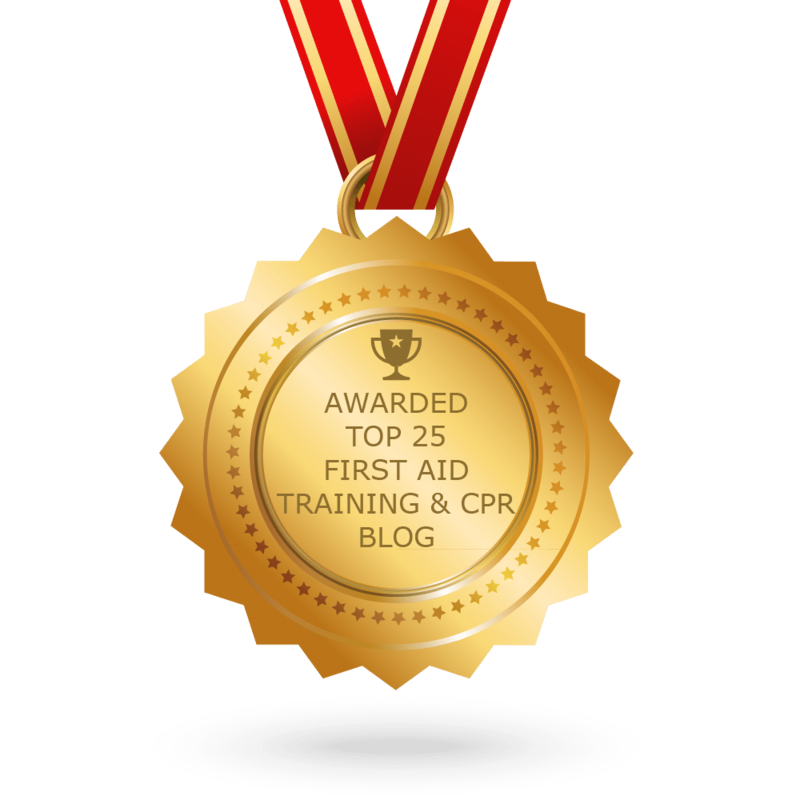 She is the Founder and CEO of First Aid for Life, a multi-award-winning, fully regulated first aid training provider specialising in first aid and medical emergency training for Dental Practices. 1.Valenzuela T D, Roe D J, Nichol G et al. Outcomes of rapid defibrillation by security officers after cardiac arrest in casinos. N Engl J Med 2000; 343: 1206–1209. 2.Jevon P. Medical emergencies in the dental practice. 2nd ed. Wiley: Oxford, 2013.